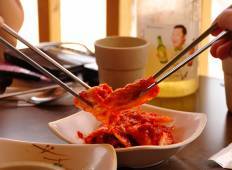 See the top Cultural trips that go through South Korea. With 38 tours to choose from, they range in length from 3 days to 13. The most popular month for these tours is May, which has the most departures. "Overall I’m Happy. I will recommend to my Friend who wants to travel to Korea." "Overall the tour was great. The guide was fantastic and very personable. The main..."
"Overall, a good tour. Covered a variety of things with appropriate substitutes where..."